Over july 4th weekend, I had some friends come to town from different directions. I’ve never had the chance to really show these particular friends the fun and adventure of churrasco, so it was a treat for all involved. It was unusual for them. Shortly into it they were taking pictures with their iphones and before even the first meat came off the Churrasco grill, I began to see posts pop up on facebook of everything grilling. Different schools of thought exist on how to properly season churrasco meat for the grill. I do not typically marinate my meat for the grill. Instead, a simple mounting on the skewer, a generous dose of salt and the melting fat of the beef often do the work. I do however acknowledge that that one can always make the perfection even more perfect. So a good marination of the meat can be in order just to kick things up a notch. Or to create variety. Picanha, or sirloin tip, often speaks well for itself and requires no marination. Other parts of the sirloin, such as pork and lamb, really benefit from the added moisture and flavor. A good way to think about marinades for the churrasco grill is to think back to the fire itself. And how it cooks the meat. The coal fire has a way of searing and drying the meat, so anything that keeps moisture in is a good way to go. I like to use a vinaigrette mixed heavily with garlic to marinate for churrasco. The oil keeps the meat from drying out. 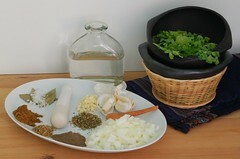 The vinegar helps the marinade penetrate and occupy the cells of the meat. The garlic always sends the flavor off to heaven. A good marinade is best when simple. Without too many flavors competing for dominance, the meat will ultimately win out over them. I find it’s a good idea to give the meat a good rub down with the marinade about 4-5 hours before you light the coals. Leave it outside of the fridge to allow it to warm up closer to room temperature for more even cooking. Starting temperature can mean a lot, especially with a churrasco grill. Since you’re constantly balancing between what is cooked and what is not on the very same piece of meat as it cooks. This is something to keep in mind. So usually around breakfast of the day I grill, I pull the meat out of the refrigerator and allow it to start warming up. Working in a marinade or salting it at that point allows the chemistry to start working in your favor. It also helps in letting the meat relax and get ready for the grill. Hopefully, this will be a helpful tip that will lead to great success around your fire pit.